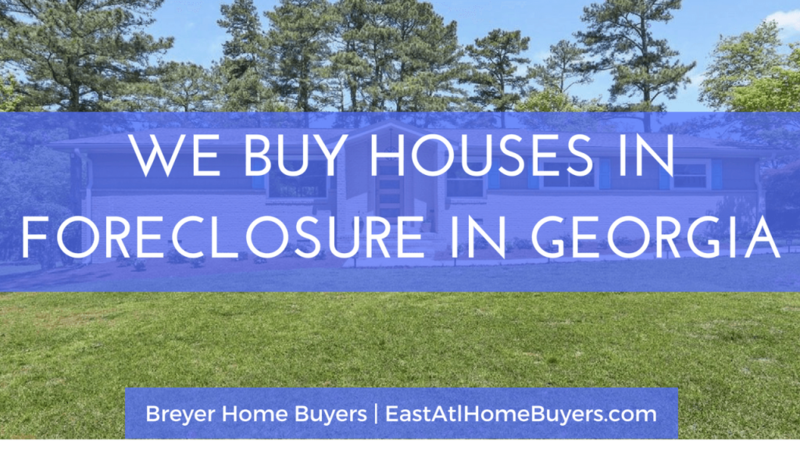 To many people, the thought of losing your home to the Georgia foreclosure process can cause sleepless nights. Nobody wants to uproot their family from a neighborhood they have settled in comfortably and relocate them to a place they’ll have to start over. Unfortunately, this is the case for most people who are served with foreclosure notices. The mere fact that you have received foreclosure notice shouldn’t determine the fate of your Georgia home. 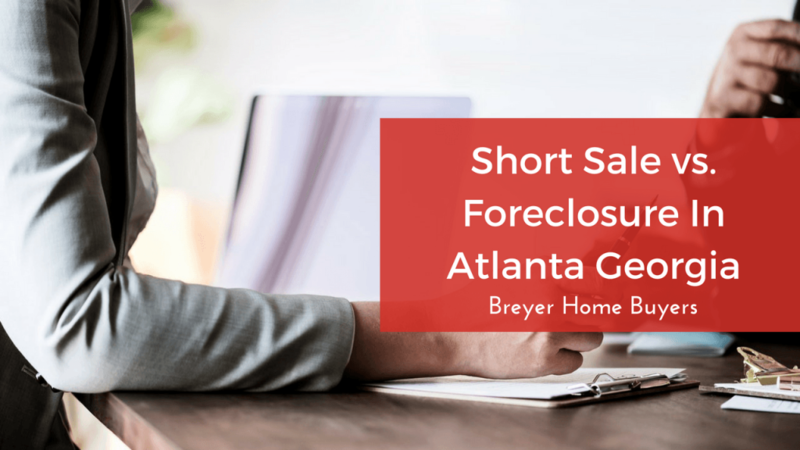 If you’re facing the foreclosure process in Atlanta Georgia and you’re asking yourself, “How can I stop my foreclosure?” then read on. Most people fail to realize that they actually have various options in an attempt to stop foreclosure in Georgia. Understanding how the foreclosure laws in Georgia work will help you know how to stop the foreclosure sale on your home; if not, you will at least be able to have delayed it long enough to get your finances back in shape and avoid foreclosure. The big question you should be struggling to answer once you get that dreaded foreclosure eviction notice is what can I do to stop my foreclosure? 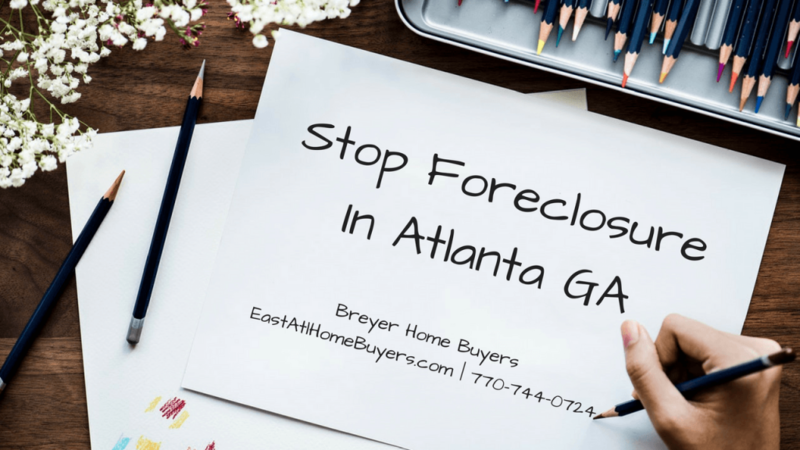 Let us look at the options you have that can result in stopping the lender from foreclosing on your home in Georgia. Filing a bankruptcy case instantly stops the foreclosure because of the Automatic Stay. Even if the foreclosure in Georgia happens after you have filed the case in circumstances that the foreclosing lawyer wasn’t aware, the foreclosure is void. Bankruptcy guarantees to stop the foreclosure sale even if the case is filed earlier on the day of foreclosure. It is a nice alternative for people who are in such a situation as a result of accumulating a massive amount of debt. You will get the time to organize your financial position as the foreclosure process is delayed and ensure that you retain your home. Having an attorney to help you with this option is advisable but if you are to do it on your own, expert advice and extensive research are necessary. You can stop foreclosure sale by reaching an agreement with the lender on how you can suffice your mortgage obligations. This will give you some breathing room as you work on a long-term solution and will normally include modification to the current loan. Any of such agreements you get into should at all times be in writing, with the inclusion of the lawyer representing your lender in the foreclosure sale. There is no problem with finding an out of court solution to a problem between two parties. You can negotiate with the lender to allow you work out a plan to repay that is manageable for you before deciding to take any legal action against you. This is also referred to as forbearance. If you can explain to the lender a way that you will stay current on the loan even after missing one or two payments, the lender might decide to waive your obligation. This is known as debt forgiveness, although it hardly happens. In this case, you can come to an agreement with the lender where you add a certain fraction of the missed payment to every monthly payment until you finally catch up. It’s also called repayment plan. If you have a mortgage that is an adjustable loan, your lender can freeze the rate of interest or change it to a rate that is more convenient for you. In this situation, if you have enough equity and satisfy the lending guidelines, the lender can add the back payments to your loan balance and re-amortize the loan. Some government loans have provisions to allow borrowers who satisfy specific criteria to ask for a different loan, which will, in turn, pay the missed payments. The GDCA, in partnership with the GHFA Affordable Housing, is providing an unemployment mortgage payment incentive to stop my foreclosure. “HomeSafe” in Georgia is a foreclosure assistance initiative that will help you by giving bridge mortgage aid if you are unemployed or you have experienced a dramatic decrease in your income as a result of national economic circumstances. Georgia is a non judicial state, but in some cases, the state may put a hold on the foreclosure and you will have to present clearly documented and hard evidence proving that the lender has taken the action unlawfully or has agreed with you in writing to halt his intentions on the foreclosure process. Unlike judicial foreclosure states, Georgia foreclosure laws don’t require the lender to take the homeowner to court to go through with the foreclosure process. You can consult a Georgia Realtor to get an idea of what the market value of your house is and how much you will get from its sale. Discount brokers are other people you can pursue to know your best option considering the time frame you have for the mortgage. The problem with selling through a local Georgia real estate agent in Atlanta is that you’ll have to wait for the house to sell on the market. This could take anywhere from 3-9+ months, which exceeds the amount of time that you have with the foreclosure process in Georgia. In the event your property is worth less compared to the amount owed to the lender, you can go for a short sale. This affects your credit, though it’s a better option than foreclosure in Georgia. Short sales are usually initiated by the homeowner, often when the value of a home drops by 20% or more. Before the short sale process can begin, the lender that holds the mortgage must sign off on the decision to execute a short sale. Additionally, the lender, typically a bank, needs documentation that explains why a short sale makes sense; after all, the lending institution could lose a lot of money in the process. Short sales tend to be lengthy and paperwork-intensive transactions, sometimes taking up to a full year to process. However, short sales are not as detrimental to a homeowner’s credit rating as a foreclosure is. A short sale looks better to future lenders and creditors: It shows you took action before the bank had to repossess your home. A homeowner who has gone through a short sale may even, with certain restrictions, be eligible to purchase another home immediately. This is referred to as deeding your home back to your lender. It involves the homeowner giving the lender a notarized deed, who in turn forgives the mortgage. However, this option affects credit the same way foreclosure does. The lender can make an arrangement in which you stay put in the home until you find a place to relocate. You should, however, negotiate to remain as the occupant arguing that if the lender was to push through with the foreclosure, you would still possess the home during that period. 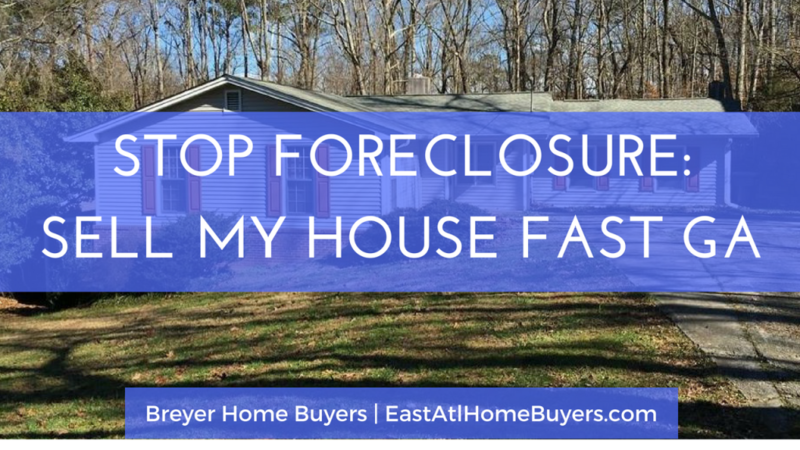 Everybody faces financial difficulties, you don’t want to be in a position where you can’t stop a foreclosure sale in Georgia if it happens to you. At Breyer Home Buyers, we have dedicated ourselves to provide you with solutions to stop foreclosure foreclosure and allow you to move on with your life. If you happen to find yourself facing foreclosure in Atlanta, Georgia call us now and we can get you out of your property quickly. We can close in as little as 7 days. When you’re going through the foreclosure process in Georgia, speed of sale is key. We may be able to help you avoid foreclosure in Georgia… connect with us today and let’s discuss your situation. 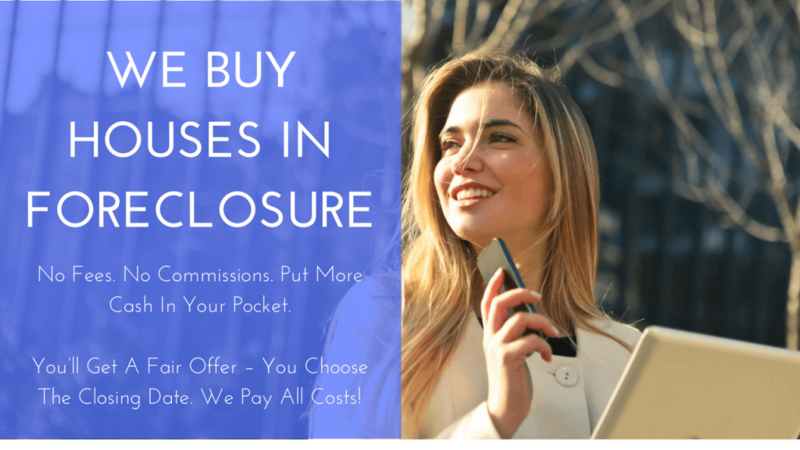 We don’t charge any fees… we’ll evaluate your situation… and present you your options so you can move forward and get this foreclosure behind you.